Requests to venture beyond Makati on a day other than Sunday are usually diligently denied. Life, after all, is much too precious to waste inside a vehicle. But it is a Monday and we have allotted two hours to travel through the twists and turns of Manila because exemptions must be made when it's about an authentic Hokkien lunch. To navigate the extensive bumpy roadwork to Auntie Gemma's house is to navigate back through childhood Sunday lunches with ammah and angkong. Auntie Gemma is a spry 80-year-old who takes her dog Bingsu on daily morning walks. Though she's been a prolific cook most of her life, she—together with her daughter—started her online food delivery business only three months ago. The recipes precede Auntie Gemma herself. She learned them from her mother then further honed her repertoire by bartering wine for dishes from a Cantonese chef at the Peace Hotel during the '70s. We ask her daughter, Oi, what makes good Hokkien food, and she replies cheekily: "Brown in color, but very flavorful." That's not entirely true. Her mother's table is a sight to behold: brown primarily, yes, but topped with verdant bokchoy, bright yellow eggs, fresh shrimps, specks of herbs. There's even a plate of crisp lettuce for some healthy wraps. Yes, it's not preened for the social media, but anyone would tell you that this kind of Chinese food is best enjoyed at home: generous though humble and invites you not to take pictures but to dig in while it's still hot. With the recipes perfected for years, they decided to take their business online. "It's hard to find these traditional party dishes available for delivery," explains Oi. "I have to bring 11 friends to eat with me for a 12-course Chinese meal." Wok With Mom was born and quickly boomed. "We had one order that required 17 chickens for a party," adds Oi. 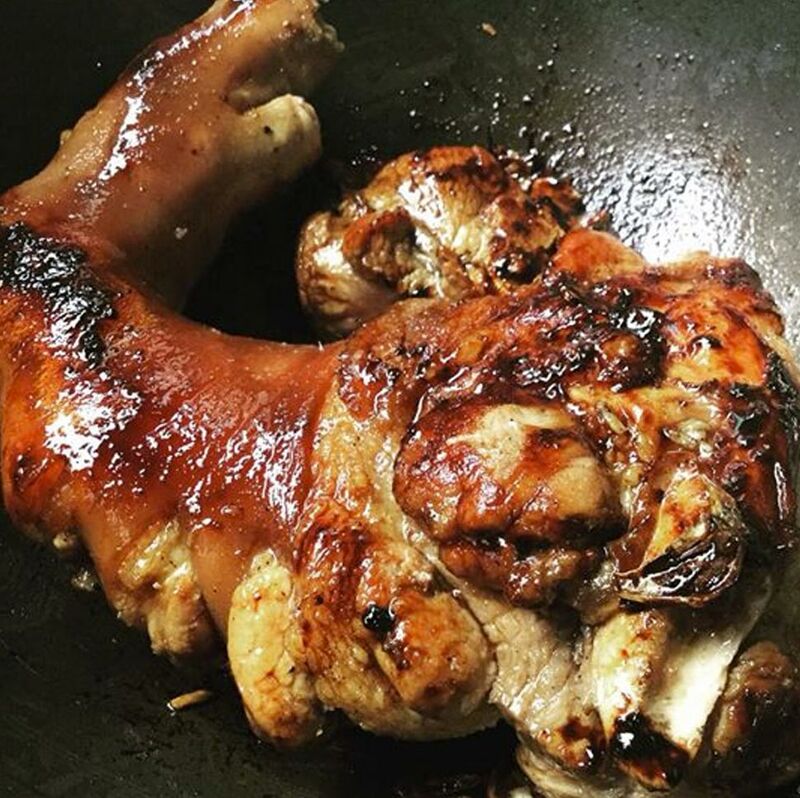 According to Oi, the sweetish braised pork knuckle is a favorite order among their Filipino clients. 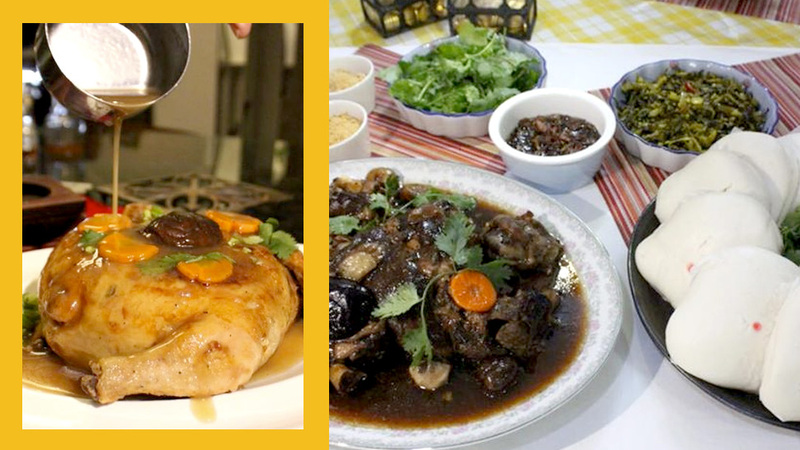 Their specialties are signature Hokkien dishes, the type you'd find during special occasions: long life noodles, pork knuckles braised forÂhours (patatim), stuffed cuapaos. The lettuce wraps are interesting paired with filling made with more veggies than the usual ground meat or duck. 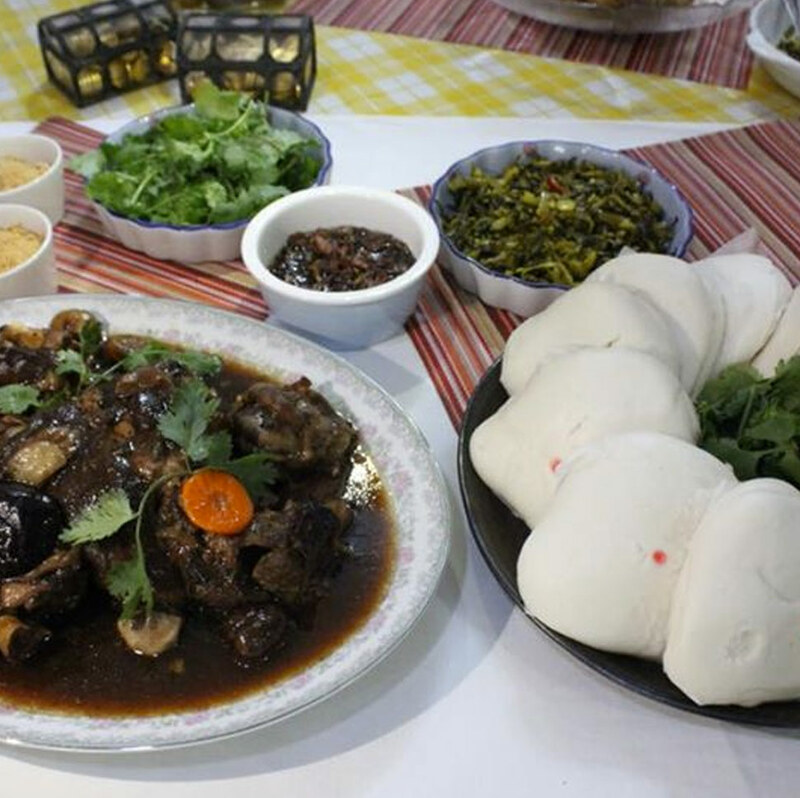 The result is nicer, lighter, a better complement to the rest of the hearty Chinese dishes. Auntie Gemma is especially proud of the eight-treasure stuffed chicken, a dish that's rare even in restaurants due to its cumbersome preparation, and the dish that required their few staff deboning and stuffing 17 chickens. At her home, even something as simple as meatballs feel like a celebration. The so-called "lucky" meatballs are small—more crispy than meaty but stuffed with nostalgia from childhood when our own grandmothers would refill our plates with more and more meatballs. Wok With Mom might seem overly simple in today's dining landscape, but after all the twists and the turns from all these new restaurants, we'll always end up at home—and home is exactly what Auntie Gemma's cooking drives, well, home. For orders, contact Wok With Mom at 0917-866-3562 or through www.facebook.com/pg/WokWithMom.